Old media gets new life at the annual celebration of music shops this Saturday. It wasn’t too long ago that my budget for music exceeded my budget for food and—some months—even rent. In those pre-broadband days, I would plan trips to any of the dozen record stores in my neighborhood to stock a weekly binge of four or five new albums. Spotify has proved a savior for my budget (though not for everyone’s), but there’s still a lot to be said for holding physical media in your hands. 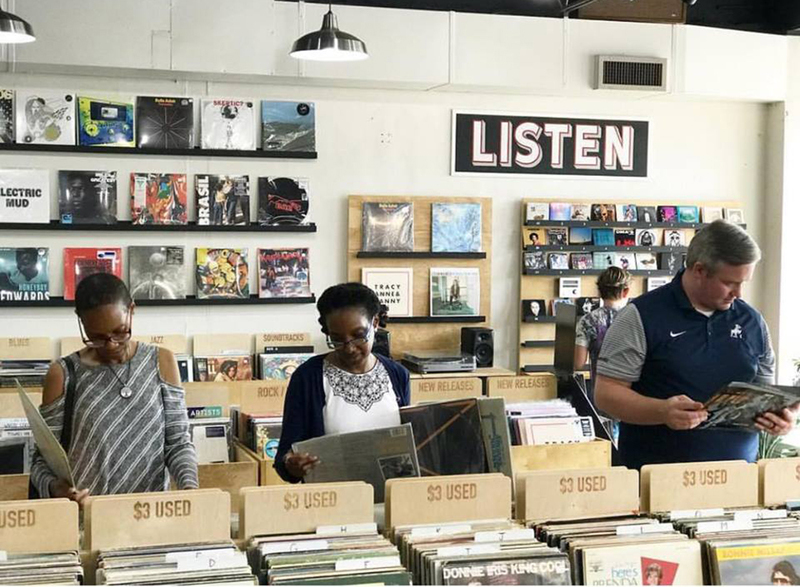 That’s why Record Store Day, the music industry’s attempt at maximizing the recent resurgence of vinyl nostalgia with limited-edition brick-and-mortar record shop releases and remixes, is always circled on my calendar—and why it should be on yours, too. So break out the red pen for this Saturday, April 13. This year’s Record Store Day marks the release date of a cavalcade of new and out-of-print records from all genres, including a cassette reissue of Prince’s 1995 The Versace Experience; a new remix single on vinyl from rap royalty Busta Rhymes and Anderson Paak; an EP of unreleased songs from Elvis Costello (including collaborations with Paul McCartney and Burt Bacharach) titled Purse; a triple-disc, mono remaster of the original Woodstock soundtrack; and a new collaboration between Erykah Badu and James Poysner, who cover the Squeeze classic “Tempted.” All those are limited-edition releases; you’ll need to get them in-store this weekend or else overpay on eBay. Record Store Day also gives local outlets the opportunity to show off their spaces. In that regard, no shop is doing more than Williamsburg megastore Rough Trade. You could easily schedule a full day solely around its programming, which includes live sets from folk musician Steve Gunn, blue-eyed soul singer Eli “Paperboy” Reed, and alt-rock trio Teen; DJ sets from Charly Bliss and Ian Williams of the math-rock band Battles; plus record signings from Wayne Coyne of the Flaming Lips and Grammy- and Oscar-winning producer T-Bone Burnett. While you’re in Brooklyn, don’t miss the just-opened Brooklyn Record Exchange, located in the same building as the excellent concert venue Elsewhere. Local DJs will be playing rare tunes all day, and you’ll get first dibs on a fresh set of new classic vinyl inventory, with the vast majority of albums going for less than $5. At that price, you’ll have money left over for tickets and drinks for a late-night set with excellent avant-house DJ M.E.S.H. Sure, I still rely on streaming for my day-to-day listening, but I can never resist crawling through the stacks whenever I’m near any of New York’s few remaining record shops. The fidelity of sound and emotional nostalgia of vinyl, paired with the experience of inviting a few folks over to spin the black circle, puts me forever on the lookout for records both old and new. If you’re the sort of person who likes their days to be themed, consider visiting our fave multipurpose record stops around town. For more weekend inspo, head to our app.